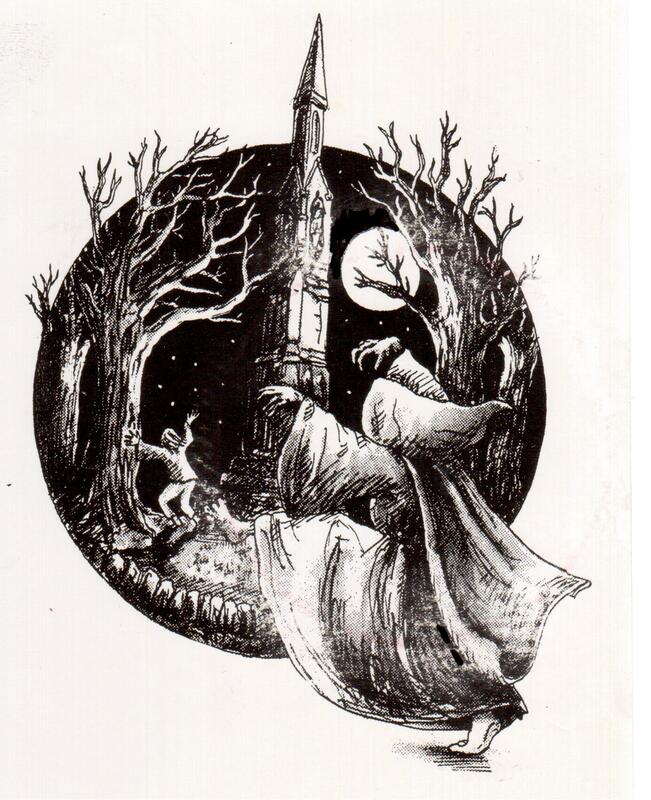 It’s Hallowe’en and time for me to tell a ghost story that is rapidly becoming Sheffield’s best known supernatural legend – the Park Ghost or Spring-heeled Jack. 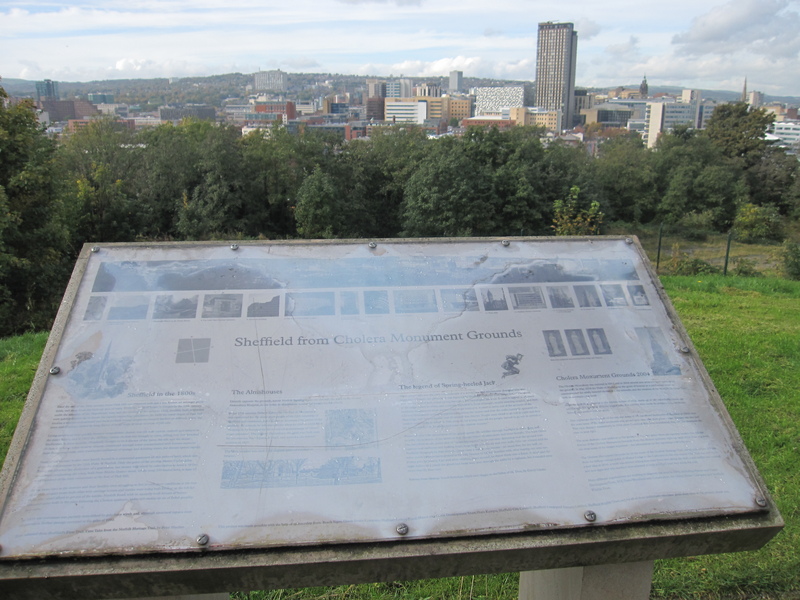 Last week I was surprised to find my account of the ghost’s pranks in Victorian Sheffield, published in one of my books 12 years ago, had been immortalised on a tourist information sign in the Cholera Monument gardens, near the city centre. ‘The legend of Spring-heeled Jack’, with text based upon a chapter in my book Strange South Yorkshire (1990) forms the centrepiece of the display, produced by Sheffield City Council. I heard the story of the ‘Park Ghost’ from my grandparents during my childhood, but in 1990 few people were still alive who knew anything about the Victorian legend. Whilst working as a journalist for the Sheffield Star, I tracked down the original accounts of the scare from the newspaper archives of the Sheffield Telegraph and the long defunct Sheffield and Rotherham Independent. Many people will have heard of Spring-heeled Jack, the fire-breathing, leaping bogeyman who terrorised London in the early part of Queen Victoria’s long reign. Spring-heeled Jack has rightly taken his place alongside Jack the Ripper and Sweeney Todd as the best known Victorian bogeymen. He was immortalised in the Penny Dreadfuls where he was portrayed as a ‘Batman’-type vigilante with a futuristic costume, wings and spring-heeled boots. And today we’re seeing a resurgence of interest in this mercurial figure with books, films and websites dedicated to re-telling the legend. So it’s no surprise that the Park ghost became known – in gossip and rumour – as ‘Sheffield’s Spring-heeled Jack.’ In the 1930s Henry Tatton wrote that the reign of terror continued for several years and sightings of ‘the ghost’ spread from the Park district to other suburbs of the city and as far as Rotherham. The scare reached such proportions that thousands of people began to congregate at the Cholera Monument and nearby Clay Wood at night waiting for the ghost to appear. An account in the Sheffield Telegraph dated 23 May 1873 noted that ‘not less than two thousand persons, principally youths and young men congregated in the haunted district, much to the annoyance of residents.’ A task force of policemen were drafted in to restore order but the youths began throwing stones and a mini riot ensued. During the mayhem that followed two officers received serious head injuries that required hospital treatment. The identity of the ‘ghost’ never emerged but there was much speculation that he was a member of well-known Park family who was assisted in his anti-social activities by a local gang. City newspapers reported a rumour that he was a ‘young fellow of weak intellect who has undertaken to appear nightly from Easter until Whitsuntide for a wager, if he successfully frightens a certain number of individuals and escapes the law.’ A similar rumour was reported to the Lord Mayor of London during the metropolitan Spring-heeled Jack scare of 1838. London newspapers reported a bunch of ‘rascals…from high families’ had accepted a wager to appear as ‘a ghost, bear of devil’ to ‘destroy the lives of not less than 30 human beings’, principally young women. The full story of Sheffield’s best known legend will have to wait until the publication of my book Scared to Death and other Victorian ghost stories. But in the meantime, watch this space for more news on the return of Spring-heeled Jack. This entry was posted in Uncategorized and tagged Cholera Monument, Clay Wood, Halloween, Henry Tatton, Jack the Ripper, penny dreadfuls, Sheffield, spring-heeled jack, Strange South Yorkshire, Sweeney Todd, the Park Ghost. Bookmark the permalink.